What does it feel like to be a woman on the street in a cultural environment that does nothing to discourage men from heckling, following, touching or disparaging women in public spaces? Filmmaker Maggie Hadleigh-West believes that the streets are a War Zone for women. Armed with only a video-camera, she both demonstrates this experience and, by turning and confronting her abusers, reclaims space that was stolen from her. 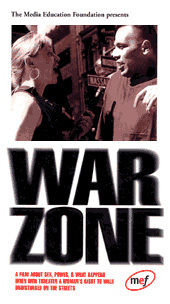 War Zone is an excellent discussion starter for both men and women. It gives voice and expression to a disturbing daily aspect of being a woman in this society. It also gives men a direct personal feeling for what harassing behavior looks and feels like to a woman. Young men who may think such behavior is cool or funny will be forced to rethink their assumptions. War Zone is a classroom, documentary edition of Maggie Hadleigh-West's first film by the same title. Her film has been screened and applauded at scores of festivals in the U.S. and abroad. She has appeared to discuss the film on the Today Show, CBS News, 20/20, BBC, NPR, CNN, and Eye to Eye with Connie Chung.